My goals for freelancing as an artist are to support myself, invest in education, and support others working in important fields or causes. To get there, it's crucial that I have a good grasp of my finances. When I started illustrating full-time in the beginning of 2017, I promised myself that I would keep good records, so that I'd be able to look back at the year and assess how it went. I made it a goal to have more than one source of income, partly as a safety measure, and partly because I'd get bored only doing one type of work. To my understanding, many illustrators and artists have multiple sources of income too - some teach at colleges, others take on day jobs and work on their art in the evenings, and so on. There is no shame in having non-art jobs, especially not if they enable you to create work without the stress of worrying about whether that work will sell or not! For 2017, my breakdown of income sources is as follows. The bulk of it comes from freelance illustration and I am grateful to have been able to work with so many wonderful clients and people. Teaching as well as non-profit work make up another quarter, providing me with other avenues to practice art. Finally, sales of art are almost negligible at 5%, since I didn't focus on this, save for tabling at one art fair and entering a few shows. Sumber pendapatan: kerja ilustrasi, kerja bukan keuntungan, pengajaran, penjualan karya seni (asal dan cetakan). It bears mentioning: that pie chart would look very different for another artist - perhaps they might focus more on selling original art pieces and tabling at shows, or teaching might make up a more significant portion of their income. Nevertheless, multiple sources of income are important because as a freelancer, you won't have a constant, predictable stream of work coming in from each of those sources. (This is also where that buffer of savings comes in to protect you!) Some months I'd go without any new jobs, either because nothing was coming in or I was finishing up older projects; other months I'd get so many offers I had to turn projects down. I read up regularly on personal finance/ financial independence, seeking to learn more about how I can meet those goals. The fastest way to get to financial independence is to cut down what you spend because the effect is exponential: it increases your savings rate, and you get used to needing less to live on. If I manage a 30-40% savings rate, I'd be on track to financial security within the next two and a half decades, barring unforeseen circumstances. A side note: the savings rate of Malaysian households is very worrying, at an average of 1.6%. Having said that, my expenses for 2017 were unusually high, preventing me from saving as much as my goal (though I still ended up with savings to sock away). This is due to buying tech equipment which I didn't already own, and taking an online illustration mentorship under SmArt School. Subtracting those two would reduce my expenditure by a whopping 40%. However, scanners and printers last for quite a while, so that's one expense that won't recur in the next few years. Perbelanjaan perniagaan: pendidikan, termasuk kelas dalam talian, buku, majalah, dan bengkel; peralatan elektronik, termasuk tablet melukis, pengimbas, alat pencetak, kos penyelenggaraan; yuran profesional, termasuk menyertai pertandingan, persidangan, dan pendaftaran perniagaan; perisian dan laman web; pembelian dari pelukis lain, termasuk pembelian karya seni serta Patreon. 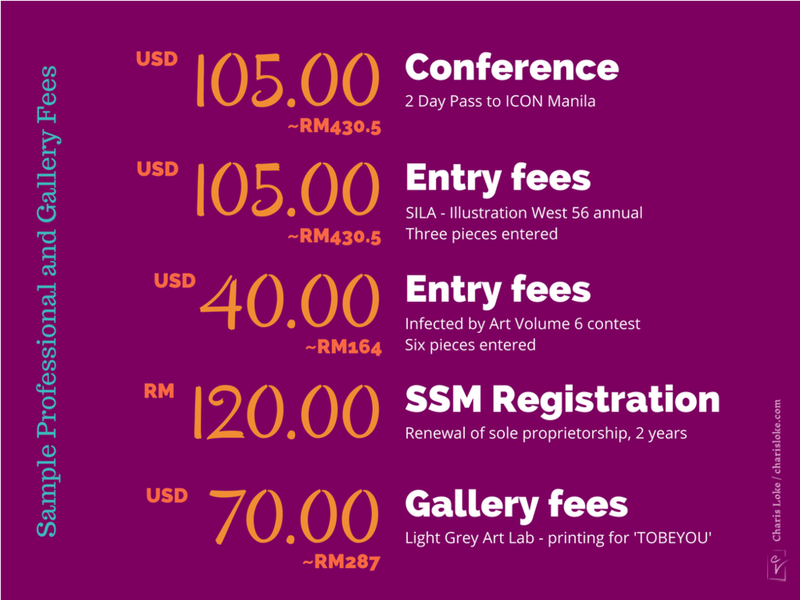 I've chosen to highlight some of my business expenses here with the intention of showing the various things you might end up footing the bill for as an illustrator. This is not a list of "must-have"s! As far as tech costs go, I design and maintain my own website which saves me the cost of hiring a webmaster. But having a scanner and printer is crucial for my work, and, after using it for six years, I chose to upgrade my trusty Intuos drawing tablet. My traditional-digital workflow is much faster and more enjoyable thanks to the Cintiq, so it's a good investment. WAYS TO OPTIMISE: Use a free hosting service for your website/ blog - some are optimised for portfolios. Share tech equipment/ cloud hosting with other creatives. Look for free software alternatives. Contoh kos peralatan elektronik dan perisian: hosting untuk laman web, pengimbas, tablet melukis, mesin pencetak, dan perisian Lazy Nezumi Pro. Next, you can't make art without your media of choice, so this is one area where you would have to shell out a little (or perhaps be an artist who works with recycled and upcycled sources). 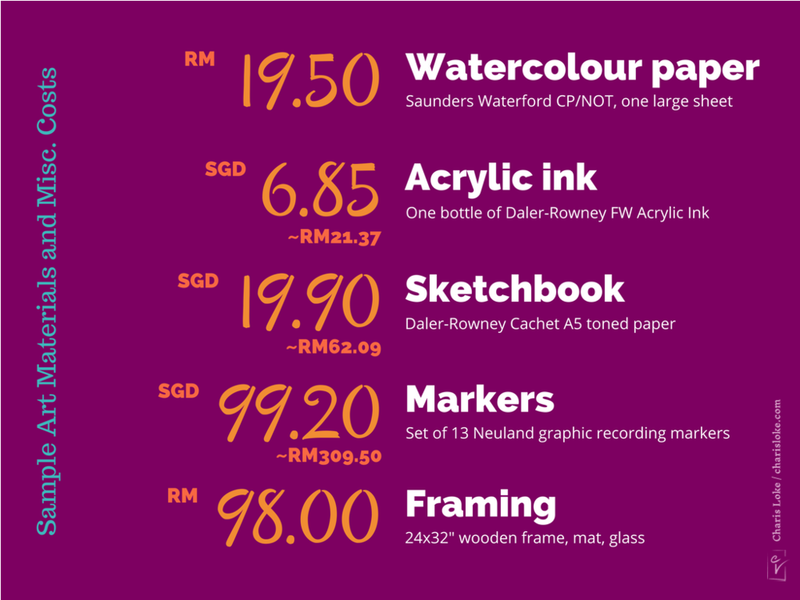 When I was a college student, I used whatever I could get at a price range I could afford; you can learn a lot with just a pencil. But being able to upgrade to better materials has been a blessing. Good paper makes a lot of difference when you're working with ink washes. WAYS TO OPTIMISE: Use the most economical brands and products you can afford; be creative with your mediums. Save the good stuff for important work, and sketch/ take notes in a cheap notebook. Trade unused supplies with other creatives. Contoh kos bahan dan peralatan seni: kertas untuk catan air, dakwat akrilik, sketchbook, markers, dan penghasilan bingkai untuk lukisan. Professional fees seem like an area which one might skip - why pay so much to submit to annuals or to have work hang in gallery shows? For me it's a way to get my work out there, see how much more I have to go when compared to industry peers, and motivate me to continuously improve. Of course, it's not a requirement - there are plenty of artists who don't submit to competitions, but are successful by any measure. Don't forget to register your freelance business for tax purposes! Contoh yuran profesional: persidangan, yuran penyertaan pertandingan, pembaharuan pendaftaran perniagaan, bayaran galeri. Is it worth spending so much on education? It depends on your priorities, but personally, I think it's a worthwhile investment. Bear in mind that books and online courses cost a lot less than a BFA or MFA, and that there are a wide range of educational resources out there, from free resources like Art Prof, blogs and videos, to subscription-based like Schoolism and Skillshare, to costlier ones like SmArt School, CGMA, the IMC, and so on. WAYS TO OPTIMISE: Get your search skills on and dive into the plethora of free educational resources out there. Figure out low-cost promotional strategies that work, and avoid spending on those that don't. Contoh kos pendidikan dan promosi: langganan kelas dalam talian, tiket ke pameran, buku, kelas ilustrasi, kad perniagaan. All of that's a rough overview of the different expenses I've incurred this year, some of which I had expected, others which were a bit of a surprise. Moving on to 2018, I'm going to aim for a 25% reduction in expenses. And if I was just beginning to learn how to illustrate or had limited resources (as I did a few years ago), I could easily forgo many of those expenses. But I would still try to spend on good equipment and materials, because those impact the quality of my work. And I would always be investing in myself - which means education and training and looking for opportunities. These resources are mostly free and won't put a dent in your budget as they help you go about your business more efficiently! Podcasts, videos, and online communities: nothing beats listening to weekly podcasts for inspiration, and being part of communities who are dedicated to growing as artists and illustrators. I like One Fantastic Week, Creative Trek, Your Dreams My Nightmares, and Make Your Art Work's ProjectCast. CroquisCafe posts figure drawing videos on YouTube that you can use for practice. Proko has anatomy tutorials and interviews with artists. There are many groups on Facebook where you can post your work and get feedback on it. Art Prof by Clara Lieu and her team is a free collection of videos, articles, and guides that cater to beginner, intermediate, and advanced artists. Blogs and business resources: Drawn + Drafted has PDFs of their bootcamps; Dear Art Director answers questions sent in by professionals, students, and aspiring artists; Muddy Colors has content that ranges from technical demos to illustrator showcases, as does James Gurney's blog, Gurney Journey. VPN: Windscribe helps you browse the web more securely, and the free version allows unlimited devices, with 10GB+ per month. 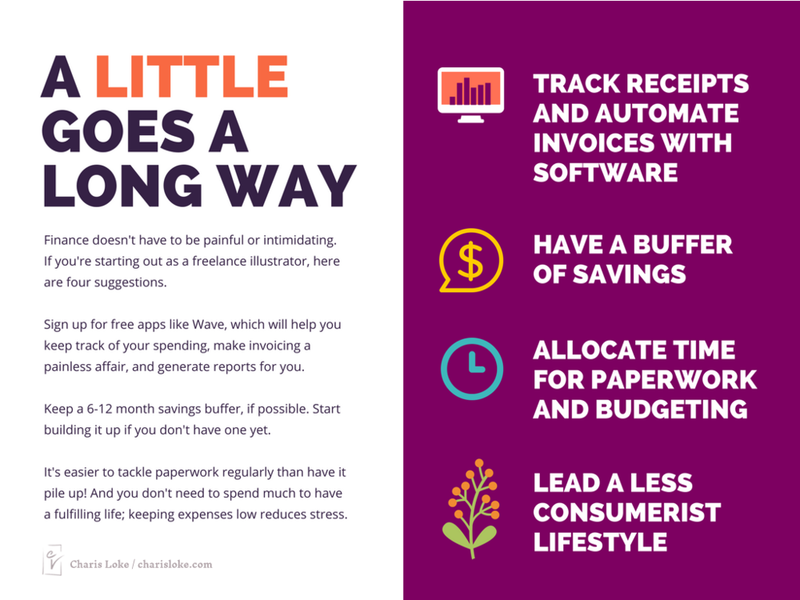 Accounting: Wave can pull relevant information out of your receipts and create transactions for your income and expenses. It also allows you to send sleek invoices to clients, remind them to pay on time, provide them with receipts, and create balance sheets and income statements. Office program suite: I don't own Microsoft Office, instead choosing to use LibreOffice - which is open source, free, and does everything I need. Scanning on your phone/ tablet: CamScanner can clean up and convert a photo of your receipt/ important document to PDF and even mail it to your inbox. Smoother lines for digital drawing: Lazy Nezumi is currently on sale for $25, and it does more than smooth out your strokes - there are ellipse, radial, and perspective rulers you can overlay while drawing. It's quite indispensable, particularly if you need to do fine linework on the computer. 4 cadangan: guna perisian percuma seperti Wave untuk merekod perbelanjaan dan menghantar invois; kumpulkan simpanan wang sebanyak perbelanjaan 6-12 bulan; luangkan masa untuk menyelesaikan paperwork dan bajet; pratikkan gaya hidup yang kurang unsur konsumerisme. If you're a student or just starting out as a creative freelancer, allow me to make these four suggestions. Try implementing them one step at a time, and see how it works out for you. The buffer of savings is important because you will have some measure of financial security should you lose your job, or not get any freelance work for a period of time. Leading a less consumeristic lifestyle has the added benefit of being better for our environment: buy less things, create less waste, reduce pollution, and save natural resources. I'm with Monbiot on this one. The stereotype of the creative artist who can't handle a spreadsheet or think about money doesn't deserve to be propagated. It's not difficult to start keeping track of your business and personal expenses, as well as create budgets and set financial goals for yourself. I'm glad I put in the time to organise the finances of my freelance work, because I have a clearer idea of what's happening with my income and expenses, and what changes I need to make to be more sustainable. This post is part of my ongoing attempts to openly speak and write about money as a creative worker - we do ourselves no favours by treating it as a taboo subject. I plan to write more content from my point of view as an illustrator. If it was helpful to you, do share it with others, leave a comment below, or make content about the topic so we can create more conversations! And consider buying me a mango lassi or joining my Patreon for access to more resources like this.